Dangling puppet. All flexible limbs, but no control over your actions. 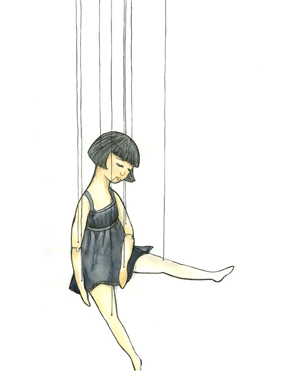 Many felt like a puppet dangling helplessly and often felt dangled and unused. Lifeless. The inability to move freely according to will is frustrating. Worst after a while, it’s dusty perhaps rusty. Worst. Mouldy. This is what happens to people who succeeded and then they hit rock bottom. When it’s good and glory everything was beautiful. Suddenly when times changed everything seem helpless and you have no control over. It is because you need more effort than before to feel good. It’s a point zero where you need a fresh new success journey. Like The Fool. Everything seems impossible, helpless, unfair, deteriorates and further spiral downwards pretend to be confident. You are packed with knowledge but you refuse to do anything useful. The story of the glory days seems to be the only story you have. Is it really? Can’t you build new stories? You were once successful. Why can’t you do it now? You have all the skills. Many wish to know what you already knew. The failure was a test, a warning, a blessing in disguise for a stronger you! Whatever assistance, ideas given are of no use. Is it really? no use or is it an excuse? Why? Ego..? Fear..? Fear of failing again? Fear of losing again? If you lost your mojo, it’s ok to be fearful, lost, frustrated and confused. All you have to do is explore by meeting more people. Perhaps your failure can teach others how not to do what you did. Find your new mojo. Don’t need to regain anything you’ve lost. Build something else for the benefit of others and yourself. Listen to others for new feedback and ideas. Time change. Phone need upgrades, so are human being. Perhaps the new you are much better and fun than before. Don’t continue to walk at the edge. It’s dangerous and it could destroy you and your family. You have so much potential surprises you have not seen. Wow so many possibilities. Which one is yours? Once a failure does not mean forever a failure. Don’t be an abandoned puppet, dangling helplessly. You can be much more than who you are now. Start today, make a change. If you want to sulk over it please give yourself a deadline. Don’t get mouldy for thinking too long. Aside | This entry was posted in Major Arcana, Tarot, The Fool and tagged Change, Denial, Ego, Emotional, Failure, Fear, Helpless, Lifeless, Lost Glory, Motivational, New Journey, Rock Bottom, The Fool. Bookmark the permalink. In love with #Coffea Coffee's Hot Chocolate. It is really very good. Fragrant. Taste of coco. Non overpowering. Not too sweet. The key is Fragrant. Brings warmth into your stomach and Spirit. Smell of love in every whiff.